Replace the old and fading flooring in your basement and kitchen with vibrant vinyl flooring in Bedford, NH. Active families with kids and pets need a flooring option that is both functional and attractive. Getting the most value for every dollar you have to spend can be difficult without focused design assistance and professional installation by flooring experts. The team at Goedecke Paint & Decorating is ready to become your partner for any remodeling project going forward. Our expansive flooring showroom features a broad array of choices from many of the manufacturers you have come to love. Browse through a number of options that give you a floor that is easier to clean. Ease of maintenance makes a big difference for anyone in your home with allergies. We offer you a broad array of choices when it comes to textures and colors. When you decide to incorporate vinyl into your approach, you get a flooring product that is designed for your way of life. Find the vibrant colors and the shapes you need to bring your original space to life. Our expansive flooring showroom features a broad array of choices from many of the manufacturers you know and trust. Vinyl is designed to endure higher levels of moisture while giving you the look at feel of flooring products like natural hardwood. Transform your home into a destination with the added savings you will realize with our 5-Star Selection System. Our design team will ask you the important questions about your project and your greater goals for your home or business. 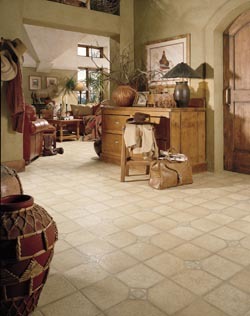 Vinyl tile flooring offers greater scratch resistance and protection from moisture. When you purchase 4- and 5-Star rated products, you are protected by our Ultimate Confidence Guarantee. For easy cleanup and an unbroken pattern from wall to wall, the best way to go is our vinyl sheet flooring. Every room is unique in some way, so it is important to have a clear understanding of the dimensions of a home. Matching the overall look is important, so decorate your bathroom with vinyl plank flooring that is designed to match the natural planks in your den. Choose a proven professional for vinyl flooring installation, and make the most of this opportunity. When you consider the warranties for installation and the added savings you’ll realize with our process. Introduce yourself to your new floors today. Contact us today to learn more about our extensive selection of vinyl flooring. We proudly serve customers in Bedford, Manchester, Hooksett, Concord, and Hollis, New Hampshire, and surrounding communities.